Divine wisdom series leading step by step to pure awareness, pure consciousness, infinity. We will begin with a story, the greatest and most effective way of conveying knowledge. Once upon a time, long ago, all the Munis and Rishis approached Lord Vishnu to tell him that even though He (incarnated as Lord Dhanvanthari) had given them the means to cure illnesses through Ayurveda, people still fell ill. They also wanted to know what to do when people got sick. Sometimes it is not just physical illness, but mental and emotional illness too that needs to be dealt with. Anger, lust, greed, jealousy etc. How does one get rid of all these impurities? What is the formula? Vishnu was lying on the bed of snakes - the serpent Adisesha with a 1,000 heads. When the Rishis approached Him, he gave them Adisesha, the symbol of awareness, who took birth in the world as Maharishi Patanjali. So Patanjali came to this earth to give this knowledge of yoga which came to be known as the yogasutras. Patanjali said he was not going to discuss the yogasutras unless 1,000 people got together. So 1,000 people gathered south of Vindhya Mountains to listen to him. Patanjali had another condition - he would put a screen between him and his students and todl them that nobody was to lift the screen or leave. Everybody had to stay in the hall till he finished. So Patanjali stayed behind the curtain and he transmitted his knowledge to the 1,000 gathered. Each of them absorbed this knowledge. It was an amazing phenomenon and even amongst the students, they could not believe how they were getting this knowledge, how the master was making each of them understand without uttering words from behind the curtain. Everybody was amazed. Each one of them experienced such a blast of energy, sucha blast of enthusiasm, that they could not even contain it. But they still had to maintain the discipline. But one little boy had to go out to attend nature's call. So he left the room. He thought to himself that he would go quietly and return quietly. Another person became curious. "What is the Master doing behind the curtain? I want to see. "He got so curious that he lifted the curtain to see the Master. But just as he did so, all 999 disciples were burnt to ashes. Now, Patanjali became very sad. There he was, to impart knowledge to the whole world and all of his disciples were burnt. At this moment, that one little boy returned. Patanjali asked him where he had gone. The boy explained and asked his forgiveness. Patanjali was compassionate and felt that atleast one of his disciple was saved. So he gave him the rest of the sutras, the rest of the knowledge. But the student had violated the law and Patanjali was not willing to forget that. So he said, "since you have violated the law, you will become a Brahmarakshasa, a ghost and hang on the tree." And the only way he could liberate himself from the curse is to teach one student. Saying this Patanjali disappeared. Now Brahmarakshasa, hanging on a tree, would ask everyone who passed by one question and when they could not answer he would eat them. He had no choice and for a few thousand years this was the story. He could not find a single person to whom he could teach the Yogasutras. So he remained in the tree as a Brahmarakshasa (the lesson here being that for the one who has great knowledge, and who does something wrong, the state of Brahmarakshasa will come. An intelligent person becoming a criminal becomes more dangerous than an innocent person becoming a criminal. If a person, who knows all knowledge and then turns a criminal, it is much more dangerous). So the Brahmarakshasa was hanging there and waiting for relief. 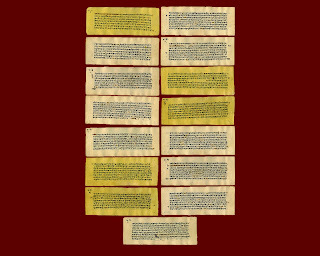 Then out of compassion, Patanjali himself becomes a disciple and comes as a student to Brahmarakshasa who told him all the sutras, which Patanjali wrote on the palm leaf. The story goes that to redeem one disciple, the Master became the disciple of a disciple. Patanjali wrote the sutras sitting on the top of the tree as that was where the Brahmarakshasa sat. Also, Brahmarakshasa worked only in the night. So he dictated the sutras at night and Patanjali wrote them on the leaves. He plucked all the leaves and made a small scratch, drew blood and wrote. This went on for seven days. At the end of it, Patanjali was tired and put everything he had written on a piece of cloth and set it down and went to bathe. But when Patanjali returned, he found that a goat had eaten most of the leaves. Patanjali then took the cloth bad and the rest of the leaves and walked away. In this story, there is a lot of depth. The puranas do not give any explanation. They just give a story and it is for us to unlock the meaning. So what is that you all have to find out? 1. How did the master convey the knowledge to everybody without uttering a word? 2. What was the significance of the veil and when it was lifted why did everybody burn down? 3. Why was one boy forgiven? 4. What is the significance of the goat? 5. What is the significance of this story? You should think about all this and come up with your own answers. This is the first in a series on Yoga Sutras..
Now, when a sincere seeker approaches an enlightened teacher, with the right attitude of discipleship (viz. ,free of preconceived notions and prejudices, and full of intelligent faith and receptivity) and with the right spirit of inquiry, at the right time and the right place, communication of yoga takes place. Yoga happens when there is stilling (in the sense of continual and vigilant watchfulness) of the movement of thought - without which there is no movement. In the light of non-volitional, non-moving and therefore spontaneous and choiceless awareness the undivided intelligence with its apparent and passing modifications or movements of thought within itself is not confused with nor confined to any of these. Then (when yoga thus happens), the seer or the homogeneous intelligence which is ignorantly regarded as the separate experiences of sensations and emotions, and the separate performer of actions, is not split up into one or the other of the states or modifications of the mind, and exists by itself and as itself. identifies with this. The seer is then elsewhere. At other times, when yoga does not happen and when the mind is busily occupied with the movement, there is a cloud of confusion in the undivided, homogeneous intelligence. In the shadow of that cloud, there arises false identification or cognition of the movement of the mind-fragment and hence distorted understanding .The single concept or idea or the single movement of thought is mistaken as the totality. These apparent movements or states or moods of the mind, which are concepts, ideas or images in it, can all be grouped under five categories, irrespective of whether they are experienced as painful or not-painful, and whether or not they are covertly or clearly tainted by the five-fold afflictions described later. (fancy or hallucination or imagination totally unrelated to any proven or assumed theories, which may also include the delusion that one is already out of the movement of thought . memory, or the recollection of a teaching or an experience which gives rise to the notion that it is possible to go beyond the movement of thought; such a notion forms an image. spiritual text, inference or proven facts. (2) deduction or extension of direct perception and sense-experience or beliefs: in the absence of direct proof or experience, indirect proof is deduced from the right or wrong application of principles of logic chosen by oneself, which often lead to vague generalizations or presumptions that " since the theory comes from a usually reliable source, it must be correct. " (3) scriptural or other trustworthy testimony or authority - where, again, one accepts as proof the statements of those whom one has accepted as THE authority, such acceptance being blind and fanatic. Unsound thinking or wrong knowledge is based on error, on mistaken identity, where the cognition is unreal and faulty and hence the knowledge is faulty, too, and where there is no agreement between the expression and the experience, between the substance and the description . Fanciful or hallucinatory expressions and even experiences or imaginations are "sound without substance", empty words and phrases or descriptions which have no corresponding reality, however realistic or inspiring or satisfying they may appear to be: hence they are the most deceptive and least trustworthy. . When nothingness or void is the content of the mind, when the idea of nothingness alone prevails, or when the mind thinks that it does not think at all, there is sleep, which is a state of mental or psychic inertia. Memory is the non-abandonment of the impression created by past experiences, Which is revived with much the same impact on the mind-stuff as at the time of the original experience, but with or without the original details and emotional response. 2) the simultaneous, effortless and wise avoidance of the distracting influences. The latter includes the non-arousal of cravings and attractions that compound one ' s confusion, and the steady perception in the inner Light that the mistaking of the mental states for the undivided intelligence, is both the cause and the effect of the clouding of the Light. Such perception is sufficiently strong and wise to know that the intelligence is forever uncolored by ignorant waywardness. Any steady and continuous or persistent and vigilant endeavor to stand firm in the understanding of the truth of the indivisibility of cosmic intelligence is known as spiritual practice (right exertion). ""It is not only necessary to have a good well rooted practice for many years but also to meditate profoundly for long periods of time. This is a way to still mind fluctuations and bring about the constant awareness of states without separation."" But, when is one said to be well grounded in practice? When this spontaneous awareness or cosmic consciousness continues without interruption, for a long time, and one is devoted to it with all one' s being, in all sincerity and earnestness . How does one avoid distracting influences, without being distracted by such effort? When the consciousness functions in a masterly way so that the compulsive and over-powering craving for objects seen or heard of, is skillfully (that is, without suppression or expression, inhibition or indulgence) turned upon itself - there arises an intense and consuming quest in quest of the what, how and where of the craving itself: that is known as uncoloredness or dispassion. Whereas in the earlier stages of yoga practice this "turning craving upon itself" may be (i) blind suppression, or (ii) an act of self-sacrifice with a reward in view, or (iii) at best an active expression of unquestioning faith in accepted authority - the spiritual quest transcends such qualified self-discipline, then THAT which is "beyond" the conditioned and therefore fragmented inner personality is directly seen to be free of all craving. The realization of the unconditioned being is at times associated with logical reasoning or examination, deep a-rational inquiry, an experience of bliss or of pure I-am-ness. Yet even at those times there is consciousness of the subject-object relationship, and knowledge of the physiological and psychological states, experiences and deeds. When in Union there is stillness but past impressions may arise. Memory in time is balanced to serve us in life but not lead us astray. Different from this is the practice that is based on cessation of all effort even at meditating: this practice leads spontaneously to tranquility. In that, only the impressions or memories remain: of such impressions is the "me" constituted. When such impressions remain, one retains the possibility (and the cause) of birth again, even after being freed from the present body and after becoming integrated with one ' s own or the cosmic nature. For, such impressions or memories nurture and perpetuate the awareness of continued personal existence. In the case of others, when such spontaneous realization of the unconditioned does not happen, such realization is preceded by and proceeds from faith or one-pointed devotion, great energy and use of will-power, constant remembrance of teachings and one ' s own experience, the practice of samadhi (the state of inner harmony), and a knowledge or discernment of such harmony - all of which lead one gradually on to that state of yoga. 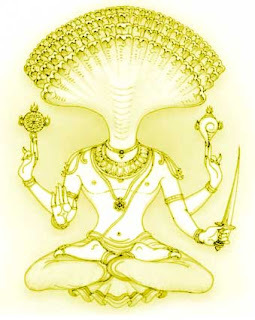 However, lest it should be misconstrued that such gradual evolution implies cosmological or psychological distance to be covered, it should be added that the state of yoga or the unconditioned intelligence is close at hand irrespective of the approach followed by the seekers - if they are full of intense zeal, enthusiasm, energy and sincerity, and are thus able speedily to overcome obstacles. Yet, again, it is possible to see a distinction between mild, middling and intense zeal, energy and effort, although yoga (which is spontaneous realization of oneness) and effort (which implies duality) are contradiction in terms. Or, the state of yoga is attained by complete, instant, dynamic, energetic and vigilant surrender of the ego-principle to the omnipresent ever-existent reality or god. This is instant realization of God as the only reality, when the (ego's?) quest of self-knowledge meets its counterpart, ignorance, and stands bewildered in choiceless encounter, and when the ego-ignorance phantom instantly collapses. That unique indwelling omnipresence that is never tainted nor touched by the ground of actions and their reactions, which afflict ignorant individuals; that which is left-over after the ego-ignorance-collapse; that special inner ruler or intelligence which is unconditioned by time and whose will alone prevails even in the body. In it there is oneness, never divided. It is therefore beyond ignorance and its progeny. That omnipresent reality, both in its manifest and in its unmanifest aspects, is the source of inspiration and intuitive enlightening experience of all the sages from beginningless time: for it is not conditioned (or divided) by time. The inner light is timeless. The enlightening experience is timeless, for, time is thought and thought is ignorance. That indwelling omnipresent sole reality is verbally alluded to as OM, which is the ever— new and eternal cosmic sound that is heard in all natural phenomena (thunderclap, roaring of the ocean, wind rustling trees in the forest, and the conflagration) and even in the reverberations of the musical instruments, the hum of engines, and the distant din of the carnival crowd. How to utilize that OM in the adoration of god ? By repeating it, at the same time, inquiring into, contemplating and saturating the whole being with, the substance indicated by it - that is, the reality or god, which is the real "meaning" of OM. Then the soul and inner self can be found. An intervention can take place to further remove obstacles from the path. When one repeats the OM in this manner, then the consciousness which is ordinarily scattered over the diversity, is gathered, concentrated and turned inward. The spirit of enquiry into the substance of the OM dispels all the obstacles or distractions without necessarily wrestling or struggling with them. Obstacles such as disease, doubt, illusion, inability to understand, laziness, gratification of the senses, slipping from progress and a scattered mind are all impediments. (1) Disease, (2) dullness, (3) doubt, (4) carelessness, (5) laziness, (6) inability to turn the attention away (from the obstacles) (7) perverted or distorted vision, (8) inability to find a firm ground for the spiritual investigation, and (9) even when such a ground is found, unsteadiness of mind and attention in the pursuit of the inquiry - these are the obstacles and distractions, for they bring about and constitute the apparent fragmentation of the mindstuff . (1) sorrowful mood, (2) psychological despair , (3) the motions of the body, and (4) inhalation and exhalation. By being attentive to these factors, it is possible to arrive at an understanding of the degree of seriousness of the obstacles: for they co-exist with the distractions of the mind. To prevent this follow a devotional one pointed pratice. A peaceful tranquility surfaces when we encourage joy, happiness and virtue. Detach from pain, sorrow, vice and suffering. The following fourfold attitude to life's vicissitudes and in all relationships, being conducive to peace of mind, enables one to overcome the distractions of the mind: (1) friendliness towards pleasure or those who are pleasantly disposed to oneself (friends), (2) compassion for the sorrowful, and, when one is in a painful condition, self-forgetful sympathy for those who may be in a similar painful condition, (3) rejoicing in the exaltation of the noble or the holy ones, and (4) indifference to unholiness, not being drawn into it nor holding others in contempt for their unholiness . After exhalation, during the stillness before inhalation, there is calmness. This can remove distractions. Or, the distractions can be overcome by literally and physically exhaling the breath and holding the lungs empty, or by adopting such other methods like fasting or contemplation of death, etc., by which one symbolically "expires" and holds the prana or life-force outside, as it were. Or, intense and vigilant attentiveness to the activities aroused within oneself by sense-experiences can also act as a binding force to prevent mental distractions. Needless to say that one should not get lost in such sense-experiences. Of such is attentiveness to breathing or to the movement of life-force, or to the "silent" sound of a mantra mentally uttered, to the subtle vision of the divine presence, or to the experience of "the space of consciousness" within the heart. Or, one may be keenly attentive to an internal (the psychic blissful inner light) or an external person or phenomenon devoid of sorrow and full of resplendence, and thus overcome distractions of the mind-stuff. Or, the mental distractions can be eliminated by the adoration of the consciousness of one or which is free from conditioning (or the psychological coloring of attachment or passion). To this category belong even divine images, celestial bodies like the sun, and enlightened living beings - or even babies - though surely one should constantly bear in mind that it is their unconditioned nature which entitles them to be thus adored. Or, the distractions can be removed by holding on to the wisdom gained in dreams, whether they are Para psychological visions or symbolical dreams, as also the wisdom gained by a profound reflection on the "message" of deep sleep, in which there is total absence of mental distraction, and in which one experiences no diversity at all. In this state, free from obstacles, one "experiences" peace and happiness which are "recollected" on awaking from sleep. Or, the distractions can be overcome by adopting any contemplative technique, using any object of meditation, one likes most, for that which one likes most holds one's attention, and the technique one likes most makes contemplation easy - provided, of course, that neither the object nor the technique itself involves or invites distraction. The mind or the intelligence thus freed from distractions encompasses or comprehends the smallest as also the greatest - for it is free from all conditioning, and from all coloring, and is therefore like the purest crystal. When controlling fluctuations is mastered the seer becomes one with the seen. The seen is known and shines forth through the seer like the suns reflection on a flawless crystal. Lest it should be misunderstood that the intelligence freed from conditioning and coloring is dull, inactive, unresponsive and void, it should be remembered that, like a pure crystal which reflects without distortion or confusion any object that is placed near it, the steady and ever-alert intelligence, too, receives and reflects the color (nature) of the subject, the predicate, and the object in all situations, instantly, spontaneously and appropriately. In the case of the understanding reached through logic or reasoning there is confusion on account of the discrepancies that exist between the word (description), meaning (in both connotations as the substance described and as the knowledge of the word-meaning) and imagination or assumption. Hence, it is unclear and uncertain. But, when the mind-stuff is cleansed of memory, the self or personality which was nothing but the fragmentation, the conditioning or the coloring (the impurity) is wiped out as it were; and the substance or truth alone shines, without distortion, logic or reasoning which is the function of the limited personality . Whatever has been said above also applies to similar distinctions between the other methods already suggested (like the method of inquiry) and spontaneous awareness. Thus, by this they and all the subtleties involved have been explained, leaving only the subtlest experiencer of awareness to be dealt with. When thus the subtle experiencer of the inner awareness is observed without interruption one arrives at that which has no identification or distinguishing mark, but which is at the same time not a void. That indeed is the realization of the homogeneous cosmic essence, though even in it there exists the seed of potential fragmentation, which is the consciousness of the individuality or the observer. A skillful practitioner that has grown aware of the relationship between divinity and the self may meditate without the use of seeds and reflection. They shine without fluctuation. Proficiency in such observation dispenses with even self-inquiry, on account of the uninterrupted self-awareness being natural: then there is spiritual enlightenment, peace and bliss. Such enlightenment is saturated with harmony, order and righteousness. This enlightenment, this understanding, this realization is quite different from what one has heard about or deduced from teaching obtained from external sources. Whereas in the case of the latter the object of study, investigation and understanding is outside of the consciousness, the realization arrived at in the former is of a special category. This special realization of spontaneous self-awareness completely transmutes the entire being and there is total change. All other habits and tendencies are overcome by habitual self-awareness . When even that special realization (with the seed of fragmentation still present) is transcended, everything is transcended, and the seeker has, as it were, come one full circle. The seeker is entirely, absorbed in the seeking. The Reality realizes itself (it is) without the need for the individual even in his subtlest state. This indeed is the enlightenment in which there is no seed at all for the manifestation of diversity.